Via Tribunali Neapolitan Pizzeria announces "5@5" in conjunction with Peroni Beer, The Stranger, Caffe Vita and The City of Seattle's Bicycle Program to raise funds for the local biking community. Wednesday, May 12th, 2010 Through Wednesday, June 9th 2010 Via Tribunali Neapolitan Pizzeria will host its 5@5 campaign in conjunction with Peroni Beer & The Stranger to raise funds for the local biking community. 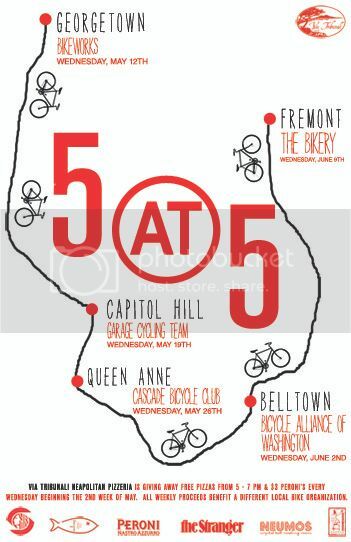 5@5 is a campaign focused on raising funds for the Seattle biking community. Every Wednesday beginning May 12th we will open our doors to the Seattle biking community. Ride your bike and you will receive a free margherita pizza and we will be selling $3 Peroni Beer. The $3 purchase of Peroni will be donated to the selected biking community partner on the given week. Each week 5@5 will take place at a different Via Tribunali Location from 5-7PM. Addresses for locations are on the Via Tribunali website.